Romantic, private, feel as one with nature. the morning as raccoons will bid you goodnight from there perch on the tree limb. Deer and wild turkeys also can be spotted in the dawn and dusk hours of the day. There are a multitude of trails inside and outside of the park to enjoy. compare to the awesomeness of that place, truly magnificent! We created a very beautiful space which is truly unique yet very comfortable. designed to fulfill the glamping nature connections we seek when in the mountains! Beautiful wood plank floors and art to see! If there is anyway you happen to get an itch to know what is going on in the world, yes, we do have internet, but decided that a TV was not a necessary element in our space with all the streaming devices we have become so dependent on! Turn them off and relax! rivers and streams to take refreshing dips with the summer heat. to find you that is what you are after! Yosemite Shuteye is a nice place! I'm Helene. I've been living in the mountains here for more than 40 years because I love nature, the lakes and all things natural. The mountains are in my blood. I've been in the hospitality business for more than 40 years. Timothy and I had a vision, and built our place to share with likeminded folk. I'm a longtime lover of the blues. My father taught me to love and respect nature, music, camping and peaceful co-existence. I was born and raised in North Hollywood. Every summer we rented cabins at Bass Lake, which is how I came to call Oakhurst home. My life motto is 'be kind to people." 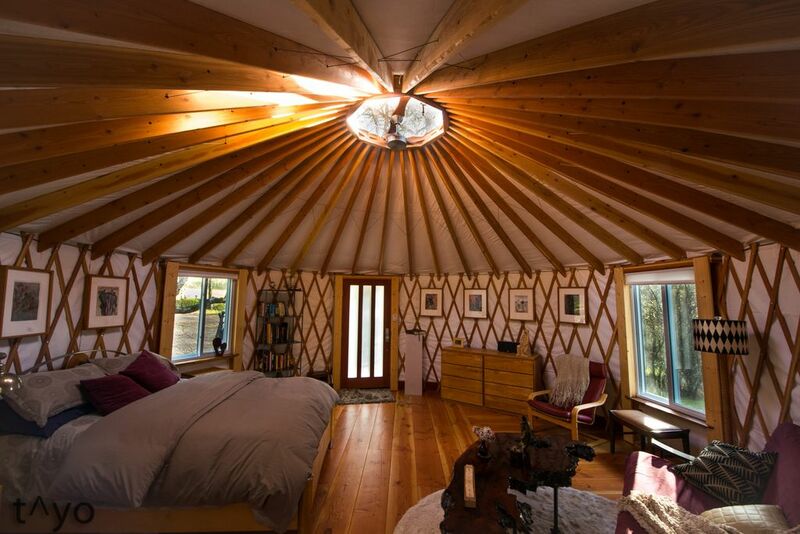 We love the unique quality of our yurt. We built it ourselves and put many personal touches and quality into the design and functionality. We would love to stay in it ourselves!!! Our yurt is just quality with a sense of being in nature at the same time as having the luxury of comfort combined with all the simple nice amenities of home. Truly a refreshing place for mind and body. It has become a go to for romantic couples celebrating life and each other! Easy to use gas powered fireplace with timer/small infrared heater for bath. usually for the duration of the stay, but freshened upon request if necessary! mid size, plenty for your stay, sparking clean! 2 burner with high BTU's! outside grill works well as oven! Everything you need!!! You will love it! A special place to visit...will leave with a smile on your face! A very unique property. It was tremendous. It was good to relax and have a beer on the patio and just enjoy the scene. The yurt itself is very nice. A lot of little touches. The hosts greeted us, showed us how things worked and made themselves available for recommendations. The wife and I would have loved to stay longer but the logistics just did not allow it. Great place and we would certainly come back if we are in the area! Helene and Timothy were excellent hosts, giving us the resources we needed to be comfortable and also giving us privacy and quiet space to enjoy the property. The yurt is beautifully constructed in a peaceful grove that was a haven of birds and deer. We were there during the Yosemite fire season and yet we were completely comfortable. The air conditioner gave us a clean indoor space and the shaded grove was cool and refreshing. All the facilities worked perfectly and we had everything we needed to enjoy homemade meals and drinks on a beautiful balcony overlooking graceful oaks and wildflowers. We would definitely stay here again as a base for exploring the Sierras or Yosemite. We are 15 miles from the southern entrance to Yosemite National Park. A must see! About 50 minutes to the valley floor. many high country lakes and streams to explore. Our Yurt is very secluded and peaceful. Our town is 7 minutes away and has all of the amenities you might need. Hope to see you soon!